Today we are looking at the gorgeous Calli Letters set! We've also included a few extra letters to suit your mood! 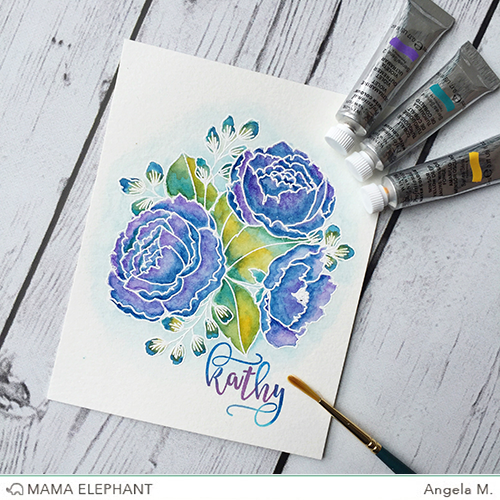 Angela heat embossed and water colored the beautiful bouquet from the Organic Bloom set and personalized it with the Calli Letter set to make this amazing card! Omg! Love this! Can't wait! oooh.. That is really cool! Ooh, can't wait to get this! Its beautiful !! Gr8 to make out own sentiments for cards . Wow!!! Love that you provided different options for the same letter. Woot! Like the new font, it provides multiple options for sure. Great idea. Wow!!!! These letters are gorgeous, and so is Angela's card!! They're beautiful! And you're going to like my post on the MarkerPOP blog on Tuesday - I'm featuring the Organic Blooms set on TWO cards!